Whether you’re moving out of a college dorm or beginning your freshman year, many benefits are to be enjoyed by living outside your school. WsYOU/Bluff City Properties is a company that rents Winona housing to students who are ready to leave the dorm life behind and live independently. Our goal is to put safe, private, and clean Winona housing units within the reach of young learners. Additionally, we promote overall student welfare by offering paid internships, granting academic scholarships, and participating in athletic sponsorships. When you’re comparing off-campus Winona housing options, remember that you have to live within reason. This means you’ll want to avoid settling for something that’s beyond your budget or not affordable. Finding a great Winona housing unit only to realize you can’t afford it not just causes disappointment but also wastes your time and energy. That’s why setting your budget prior to your search for a proper Winona housing is important. You also need to factor in other Winona housing costs that come with the rent, including bills for utilities, cable, and internet. Moving out of your college dorm means reaching school may take longer than before. You’ll want that distance to be as short as possible to save time and resources, so your commute is an important consideration when looking for a nice, quality Winona housing unit. Determining the university buildings where you spend most of your time is a good start. You can then narrow down your Winona housing options to include only those near the area. WsYOU/Bluff City Properties is unique for two reasons. Because we understand that unpleasant events can happen without warning, our staff is on call 24/7. You won’t find any other Winona housing team that is dedicated to the welfare of their residents every day. We’re also the only Winona housing office next to Winona State University. This makes our headquarters easily accessible to students of this academic institution. Guests and residents alike won’t have to walk or drive long distances to travel from campus to our Winona housing units. Before you sign the lease for a Winona housing unit outside your campus, don’t forget to ask about the amenities. You’ll want to know what exactly you’re being offered and decide if these features are enough to meet your day-to-day needs for off-campus living. At WsYOU/Bluff City Properties, we want your stay with us to be as comfortable and hassle-free as possible. That’s why we’re proud to say our private, quiet Winona housing units offer a full bathroom, sleeping area, and kitchenette. If you want a secure, well-maintained, and clean Winona housing unit, don’t just rely on website pictures. 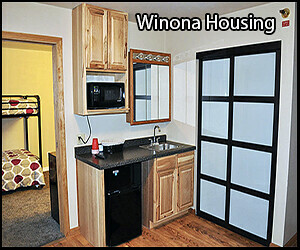 You need to see your preferred Winona housing unit in person to have a complete view of its structure and features. Those interested in touring our Winona housing units at WsYOU/Bluff City Properties are free to set up a showing. We’ll meet with you at our office, and from there, we’ll go to the Winona housing units you selected from our online portal. Our team is also willing to give you a ride should you need it. Living off campus lets you immerse yourself in communities outside the campus bubble. Moving into a Winona housing unit outside your school also helps ease you into adulthood, so why not become a WsYOU/Bluff City Properties resident? We can offer you a safe place to stay while helping you improve your life as a student. Contact us today for a property tour.